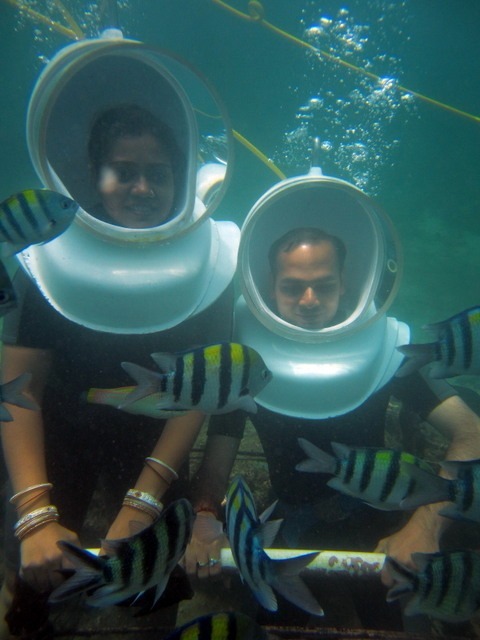 We explored under water sea walk in Bali at Sanur beach, last year during our trip.The under water sea walking was truly amazing and thrilling experience to go 85 feet deep under water and be part of aquatic life. 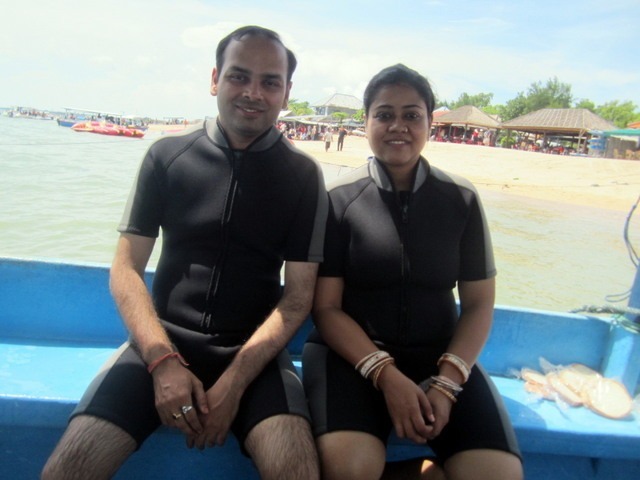 Although my wife Shreya knows how to swim perfectly but i was a complete moron who never stepped into the swimming pool ever before. 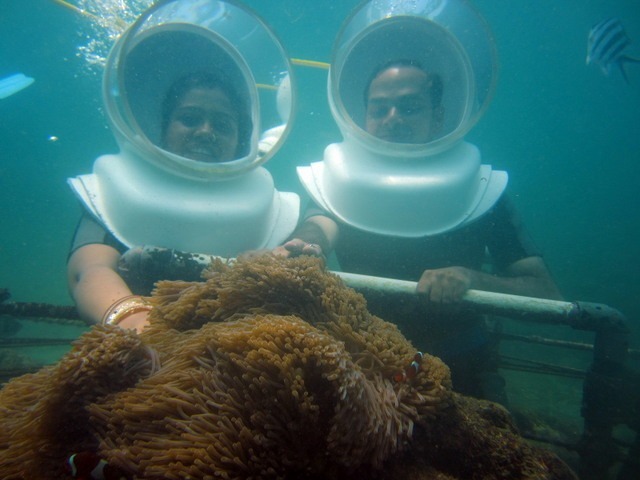 Still when we got the offer to do sea walking, i was the one who was more daring and excited as compared to Shreya who was a bit scared. May be because she knows how different it is to swim in sea and rivers where you are at the mercy of undercurrents totally; which is not the case in swimming pools where you can control your movements. So being a complete novice in swimming, i immediately said yes for the offer to have a walk underwater. Now comes the price negotiations part, where we tried to use our Indian bargaining skills to bring the prices down. A couple of yes and no, moving here and there and making many faces and we agreed finally to US$ 100 per person which included 30 minutes of underwater sea walk, a tour to turtle island in glass-bottom boat (which was useless as nothing to see), underwater photography with CD and diving dress. 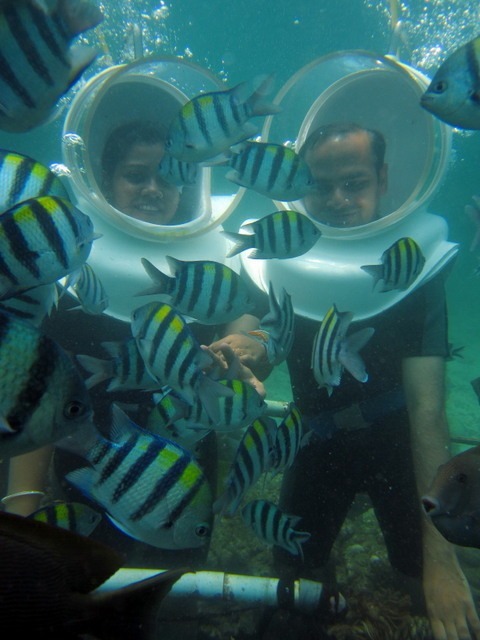 We spent almost 30 minutes under the sea. We fed bread pieces to fish and saw marine plants, magnetic stones and beautiful scenery. Cost : US$ 100 per person inclusive of 5 minutes under water video and 100 underwater photos + Visit to Turtle Island in “glass-bottom” boat. This entry was tagged Adventure, Asia, Bali. Bookmark the permalink.